The LilyPad sewable electronics product line has a rich history of being a powerful tool for engineering and computer science education through hands-on craft and fiber arts processes. 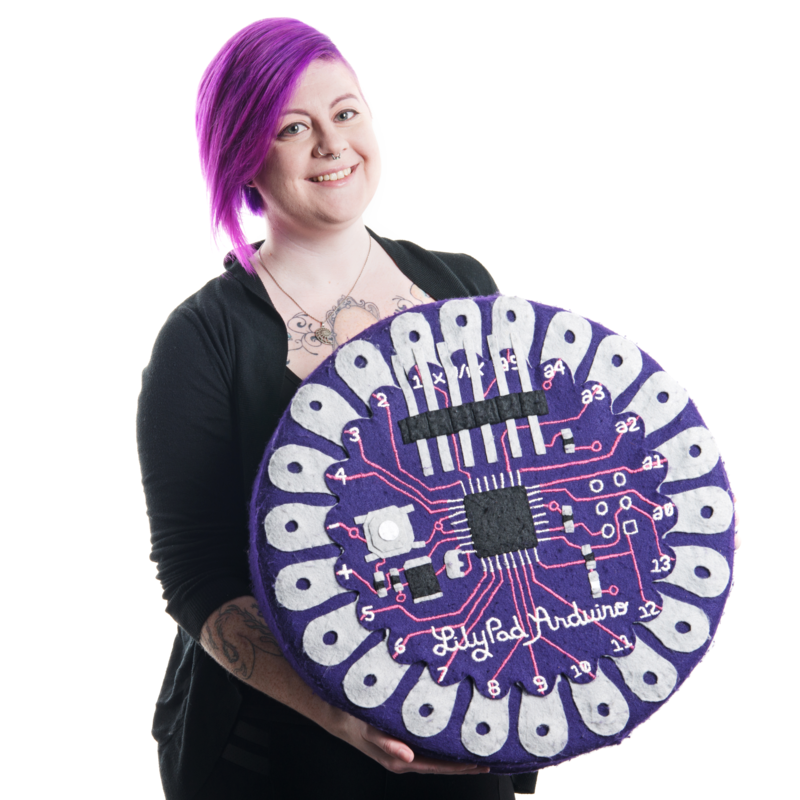 LilyPad creator Leah Buechley worked directly with students and makers while developing early prototypes of the hardware we now know as the LilyPad Arduino toolkit. 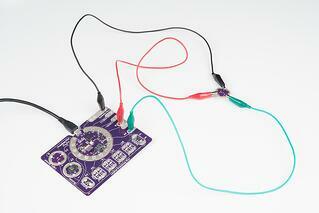 The first commercially available LilyPad Arduino kit from SparkFun, released in 2007. Buechley's insight into user-focused design — as well as her continued collaboration with SparkFun's product development, engineering and education design teams — has helped SparkFun create a product line that has evolved into a compelling choice for educators focusing on maker education and STEAM efforts. Let's take a look at some of the evolutions the LilyPad boards have gone through to make it more education friendly. One of the first major changes to the LilyPad line based on customer feedback was the decision to enlarge the holes on the sew tabs around the edge of the product. 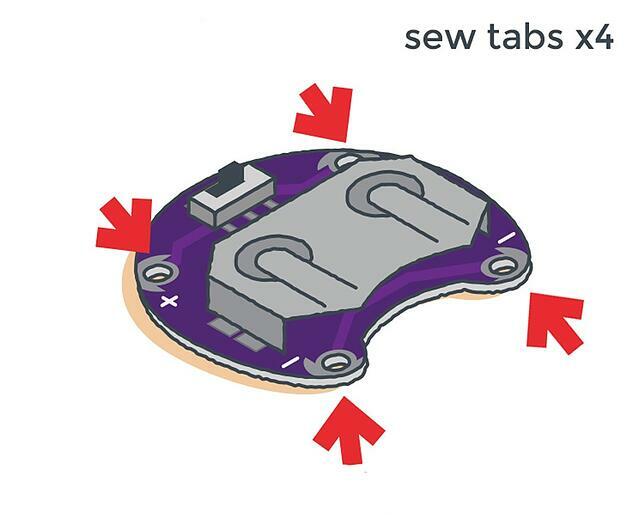 As the SparkFun team began to teach more with e-textiles, they realized that the small holes in the boards were hard for makers new to sewing and younger audiences to push a needle through. The decision to enlarge the holes in LilyPad sew tabs is one that improved accessibility; now customers could use larger needles that were easier to thread and handle while constructing their projects. The size of the sew tabs is something that we still hear positive feedback about to this day. Another education-focused update to the line was the release of the LilyPad Arduino Simple in 2010. This board reduced the number of sew tabs available on the LilyPad Arduino to provide more spacing between tabs for beginners and focus the complexity of projects for those just starting out (the original 22 tabs of the LilyPad Arduino Main Board were rarely all used in a project). The LilyPad Arduino Simple format was later used in the LilyPad Arduino USB — swapping the FTDI chip and connector on other LilyPad boards with an onboard USB connector and ATMega32U4 chip to provide a direct-to-USB option. The LilyPad Arduino USB has remained one of the most popular choices out of our LilyPad offerings for education and received an update for the new LilyPad ProtoSnap Plus. The original ProtoSnap series, launched in 2011. In 2011, SparkFun launched the ProtoSnap series, pre-wired boards developed to encourage users to get started programming and prototyping circuits without needing to build them first. These boards get users started quickly on a project by being able to test, observe and visualize the connections and then snap apart the hardware to build into their project. 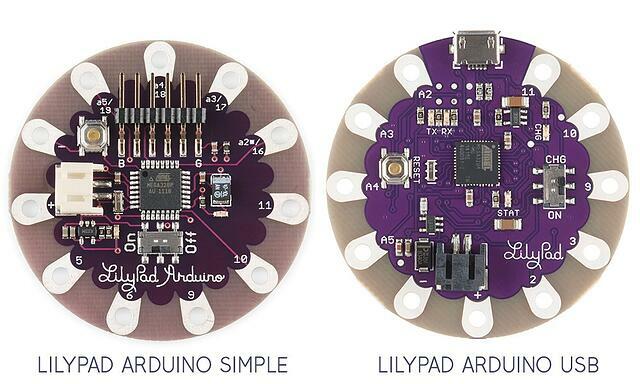 The original ProtoSnap series included two LilyPad products: the E-Sewing ProtoSnap and the LilyPad Development Board. The LilyPad ProtoSnap series proved a valuable learning tool before students started sewing and designing their projects, allowing them to iterate on their design and think through their construction before stitching. 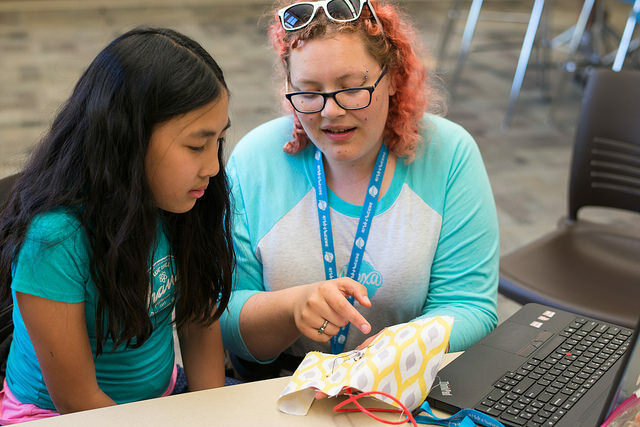 An instructor at iD Tech's Alexa Cafe collaborates with a student prototyping with LilyPad sewable electronics. iDTech serves as one of SparkFun's key partners in providing feedback from their use of LilyPad products in summer camps. 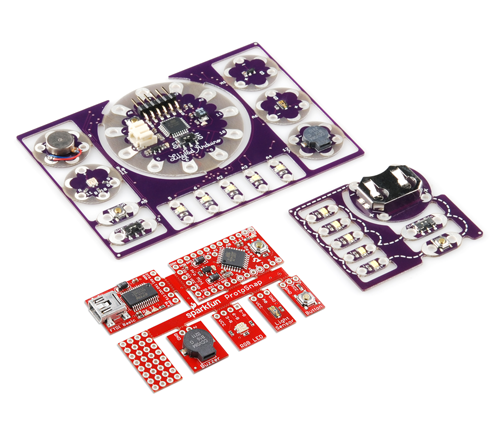 The LilyPad Sewable Electronics Kit was SparkFun Education's first major effort in product development with an active tie to the education community during the research and development process. While customer feedback had always been an essential part of SparkFun's development process, this kit incorporated a focus group of seasoned educators specifically in the e-textile field for their professional feedback. The Sewable Electronics Kit includes a printed guide, templates and craft materials to guide beginners through four e-textile projects. The latest offering in the LilyPad product line, the LilyPad ProtoSnap Plus, fully embraced this process with some key updates for ease of use for both teachers and students. After initial feedback through surveys, conversations and trend observations, the team invited a group of educators to participate in the prototyping cycle via feedback on product samples and content drafts. The LilyPad ProtoSnap Plus is an update and re-envisioning of the successes of the LilyPad Development Board, one of our most popular products. After many discussions with educators using the LilyPad Development Board in their programs and classrooms, our development team created a new board designed with new features and updates for improved ease of use for both students and facilitators. Clear, Visual Layout — The silver traces connecting LilyPad boards together to illustrate their electrical connections are a key feature of the ProtoSnap series. The new LilyPad ProtoSnap Plus includes easy-to-follow traces for students to use as a guideline for their design projects before breaking them apart and during programming lessons. LilyPad USB Plus — Many educators prefer the LilyPad USB over other formats and have been asking for an update to the Development Board to include one. 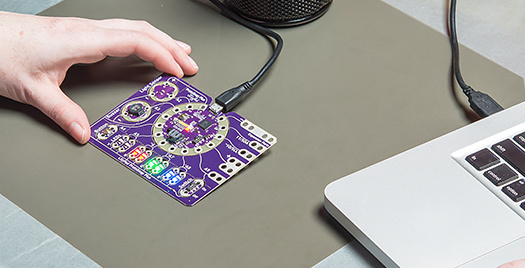 SparkFun's product team created a new LilyPad USB Plus with added features including a built-in RGB LED and bar graph of LEDs, as well as two additional power (+) and ground (-) sew tabs for ease of use. Updated labeling — Each sew tab on the LilyPad USB Plus includes a symbol (~) at the center indicating PWM capability or analog-to-digital converter (ADC) for quick reference for users during prototyping. This eliminates the need to look at documentation or datasheets while teaching and building. These labels are also included on the bottom of the LilyPad boards. The labeling extends to board names clearly beside the hardware on the ProtoSnap board for quick identification when teaching or exploring. More LEDs — One of the most compelling early activities when learning to program is to create blinking light patterns with Arduino. Students can create quite complex programs using just an LED and their imagination. The LilyPad ProtoSnap Plus replaces the five white LEDs and tricolor LED offered on the original LilyPad Development Board with four pairs of colored LEDs (yellow, red, blue, green), an RGB LED and six white LEDs in a bar graph configuration. Building the RGB and white LEDs onto the LilyPad USB Plus microcontroller freed up sew tabs to connect other LilyPad boards and eliminated additional sewn connections. Expansion Ports — To increase flexibility of the new ProtoSnap Plus, four expansion ports were added that allow students to explore different sensor and output options not available pre-wired on the board, including I2C boards. SparkFun Education continues to ideate on the best product choices for maker education. Stay tuned for more product updates, activities and content produced in collaboration with our educational partners and community.